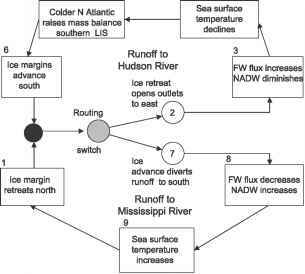 Figure 28.7 Schematic diagram of ocean-ice interaction and oscillatory switching of Mississippi runoff to and from Hudson River Valley (after Clark et al., 2001). See text for explanation. Valley, and east to the Atlantic Ocean via the Hudson River Valley, may be a manifestation of an ocean-ice feed-back oscillator (Clark et al., 2001). 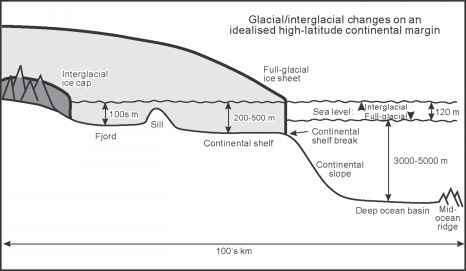 This system depended on feed-backs from the North Atlantic to the mass balance of the southern Laurentide Ice Sheet. Clark et al. (2001) model an oscillatory system for ice cover in eastern North America during early phases of LIS retreat, as illustrated on Fig. 28.7. They note that when the LIS retreated into the Great Lakes region, its margin, which comprised thin lobes of ice, overlay a soft deformable substrate. Under these conditions, the ice margin was inherently unstable and dynamically responsive to changes in mass balance induced by feed-back from changes in temperature and sea-ice cover of the adjacent North Atlantic Ocean. As global climate warmed after the LGM, the LIS retreated north into the Great Lakes basins (box 1). This retreat (e.g. from the Ontario basin) opened the Mohawk River Valley outlet to the Hudson River Valley and the North Atlantic Ocean (circle 2). As indicated in many coupled ocean-atmosphere models (e.g. Manabe & Stouffer, 1988; Stocker & Wright, 1991; Weaver & Hughes, 1994; Ganopolski & Rahmstorf, 2001, Rind et al., 2001a), the increased freshwater flux would cause a reduction in NADW production (box 3) and a consequent decline in sea-surface temperature (box 4). The colder North Atlantic would promote a mass balance increase in the LIS (box 5) and a read-vance of the southern LIS (box 6). The advance would then close the Hudson River Valley outlet and divert glacial runoff back to the Mississippi River (circle 7). The resulting reduction of inflow to the North Atlantic Ocean would lead to a resumption of, or increase in, deep water production (box 8), an increase in sea-surface temperatures (box 9) and a warmer North Atlantic Ocean. This would decrease the mass of the LIS; causing a northward retreat in the ice margin (box 1). The oscillation may then have begun again.